Cocktails on tap require an incredible amount of precision and preparation. Brian Quinn is an experiential event producer and cocktail writer. He is the cofounder of the Noble Rot, an underground supper club for wine, dubbed “a new form of clandestine drinking” by Tasting Table NYC. He learned the art of craft cocktails from work with the Milk & Honey family, as well as a love for hospitality from renowned Brooklyn oyster house Maison Premiere. Brian has written over 150 articles on cocktails for Food Republic and is also the director of programming for the Taste Talks and Northside festivals. Don’t call them speakeasies. The veil of secrecy separating two different bar experiences under one roof is simply a means of filtering out those who prefer the utility of a drink versus those who revel in the art. For bars like Los Angeles’s Walker Inn, bartenders are able to offer an omakase cocktail tasting for those who enter via the more accessible Normandie Club’s bar. Walking up a back flight of stairs at San Francisco’s Hawker Fare gets you into the more relaxed Holy Mountain bar setting, where the bar team is able to showcase more experimental drinks. Of course, Grant Achatz’s the Office beneath the Aviary in Chicago did this years ago. The advantage to finding these more intimate, highly curated bars is a more niche drinking experience that you likely won’t find anywhere else. What’s on the inside still counts, many bartenders know that these days, the most Instagram-friendly drinks on the menu will likely be the biggest sellers. A decade ago, seeing a drink like the multicolored and mint-topped Queens Park Swizzle walk across the room on a tray would incite half the bar to order that drink next. Today, with more drinking options available than ever, a well-festooned drink on Instagram might be a bar’s best asset for finding new customers. Rich Woods of London’s Duck & Waffle uses this showmanship and his unique style to entice drinkers around the globe by, say, serving a hay old-fashioned with the glass cradled in an actual bowl of hay, or creating edible garnishes, such as a ceviche shot served on top of a cocktail. Thankfully, his drinks are as balanced and brilliant in flavor as they are in appearance. Jane Danger’s now-renowned Shark Eye cocktail at the modern tiki bar Mother of Pearl — bloodied with Peychaud’s Bitters — is another example. Crystal-clear milk punches and milk-rinsed cocktails have cropped up at inventive cocktail bars and restaurants. One of the more exciting and delicious techniques that bartenders are now readily using is milk-washing, or clarifying a punch with curdled milk. The process of creating a curdled anything sounds bizarre and ill-advised, but this process dates back to the 1700s and ultimately creates a longer shelf life for the punch. Barman Gareth Howells, formerly of Forrest Point, knows this process well. He combines large batches of fruits, citrus, spices and spirits and macerates them together for several days before adding curdled milk on top. As gravity sets in, the milk proteins, which have attached to the pulpy particles in the mixture, begin to weigh down, ultimately leaving a clear liquid floating on top. Lactic in flavor, this soft and beguiling type of punch is gaining steam for good reason. Want a killer Last Word or Paper Plane while listening to Led Zeppelin in a bar that looks like it could have been the set for Tom Cruise singing “You’ve Lost That Loving Feeling” in Top Gun? Well, you can get that now, too. In their off hours or for post-shift drinks, most bartenders find themselves in no-nonsense, unapologetic vestiges where a beer or shot of whiskey might be your best bet. For bars like Brooklyn’s the Starlight, the glow of red lighting makes you feel as though you just walked into some Midwest tavern in the 1970s, except that some of the best bartenders in the city pick up shifts here and can make you pretty much any drink you want, if they have it behind the bar. No frills necessary. Time is of the essence in bars these days, and many patrons no longer care if a $15 drink was made à la minute. Eager to find solutions for those in need of a quick but excellent drink, many bars are now experimenting with having one or more drinks on tap or pre-bottled. Yours Sincerely in Bushwick — with its Transmit the Box cocktail (shown at top) — embraces this concept across its entire menu, with over 30 drinks on tap. Far from lazy, this requires an incredible amount of precision and preparation behind the scenes but allows for insanely quick pours and lower drink prices during service. London’s White Lyan turns many heads, with bartenders pouring from a colorful array of prebatched cocktail bottles stored behind the bar, which incidentally also led the bar to have very little wasted ingredients. The drinking experience at these bars does not suffer and, in fact, the effect is often a whole new world of creative cocktails. Bartenders are spending their time pining over more than just the drinks. Menus now seem to exist in their own theatrical context, with storytelling to support a bar’s original offerings. An incredible amount of work obviously goes into the Dead Rabbit’s menu, which seemingly takes months to research and create, with pages and pages of illustrations, history and cocktail lore. San Francisco’s Trick Dog takes a more playful approach, keeping patrons on their toes by presenting drinks on everything from dog calendars to a Chinese takeout menu to Pantone color swatches. Bartenders love yoga, too, and it seems that cocktails are finally taking a cue from the juicing movement, as more cleansing or healthful ingredients are becoming prevalent. More than just citrus and herbs, drinks with freshly juiced kale or wheatgrass come out bright green and seemingly healthier in appearance. Thankfully, many people now realize that vodka does not have fewer calories, but it does blend well in these cocktails. On the opposite end of the spectrum, black cocktails colored with a dose of activated charcoal might look like they could filter away your hangover, but no such luck. These deep black drinks, such as Joaquin Simó’s tequila- and mezcal-driven Heart of Darkness cocktail at NYC’s Pouring Ribbons, offer a unique appearance, but the charcoal has little impact on the flavor. With the growing availability of weed tinctures and oils thanks to loosening regulations, the slow integration of THC into cocktails will likely continue to rise in 2017. The science around being drunk and high at the same time is not entirely clear, though we do know that alcohol can allow for a much quicker absorption of the psychoactive THC by the body. Clearly, it’s an area that needs further investigation, just like knowing the right and wrong way to use liquid nitrogen in a cocktail, which can also have serious effects. 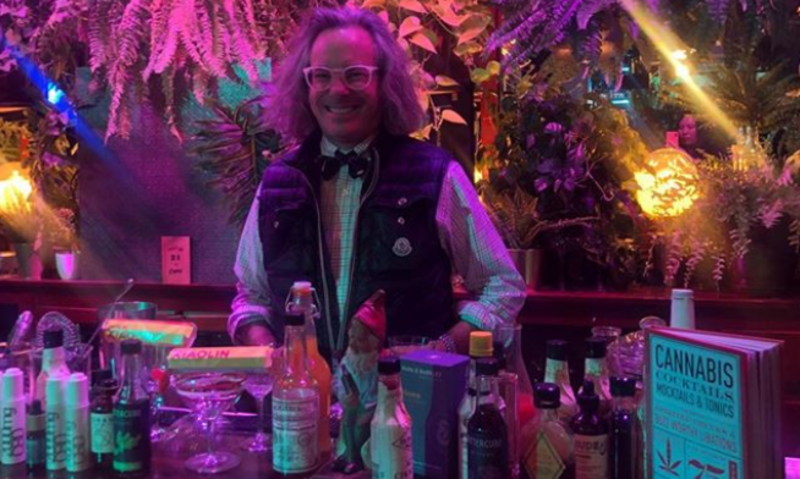 A sign of the times: Barman and author Warren Bobrow recently released the first book on this subject, Cannabis Cocktails, Mocktails & Tonics. Necessity is the mother of invention for low-ABV cocktails. Bars without full liquor licenses have to continue to push these drinks forward, leading to a rise in everything from legit wine coolers to beer cocktails to aperitif-driven coolers. Not to be left out, bars with full licenses also love these drinks, often adding spirits such as gin or liqueurs as modifiers to a largely wine or beer base in the cocktail. Seeing a Riesling cocktail on a menu might not have made sense until now, but that’s just what Maison Premiere bartender Shae Minnillo does with his Bimini Twist, using Riesling, Linie Aquavit, Pêche de Vigne, Suze, lemon and grapefruit. Serious cocktails are cropping up in virtually every city in America. Occasionally, transplant bars will migrate from a major city to other parts of the country, such as Sam Ross and Michael McIlroy’s Attaboy in NYC — ranked number five on the World’s 50 Best Bars list — opening up in Nashville. Other times, such as at the W.C. Harlan bar in Baltimore, delicious drinks seem to appear out of nowhere, driven by the owners’ unique aesthetic and approach. One thing is for sure: Deciding how to rate the “World’s 50 Best” anything when it comes to bar culture will soon be a very difficult task.